At St John’s Primary School, Clifton Hill, the grade 3/4s and I created a number of short pieces about the human body. In addition to a poppy little song and a hocket of “bodily function noises” (imagine, if you will), we created a body percussion dance routine and decided to perform it as a Flashmob at lunchtime on my last day. The plan was: I would wander out into the playground about ten minutes before the bell rang. They would all be looking out for me. I’d raise my arm to wave to them (as you do), but really I’d be doing a 5-4-3-2-1 countdown with my fingers. This would be the cue for us to start our dance, a formation magically emerging from the hordes of playing children. The music teacher was on yard duty so would join in the performance with us. Unfortunately, I can’t share the video of the event with you – it was too tricky to film it without showing any children’s faces (and we don’t have permission to publish such materials). But they loved it, loved the idea of making a flashmob, loved breaking into dance in the middle of the playground at lunchtime, wanted to do it many times over. A few others tried to join in too (an indicator of a good flashmob, we decided). Thanks to all the teachers at St John’s Primary Clifton Hill for making me so welcome during my residency. Thanks to all the gorgeous children, and thanks especially to Mary-Anne who invited me to work with her students over these last three weeks. Back in October, I led the second KEY composition workshop, with Australian Art Orchestra musicians Jordan Murray and Philip Rex. We were taking inspiration from the music of New York jazz trombonist Josh Roseman (who owns his own jazz club), so I called the project New York Jazz Club, and people signed up the moment bookings opened. We created two pieces – a laid-back A-minor groove, and a frantic, schizophrenic contemporary piece that jumped between genres, styles and pastiche with a randomness that would be right at home in any downtown New York club. Last weekend Tony Hicks and I led a 3-hour workshop on free improvisation as part of the KEY program (the Australian Art Orchestra’s program of workshops at Signal in Melbourne). We call this series of short workshops the ‘Musician’s Toolkit’, because it focuses on skills and techniques that are useful for all musicians, playing in any genre. The KEY program is geared towards teenage musicians. Here’s some footage and sound from the workshop – read on for a description of what we did to get to this point. Free improv is a big topic to tackle in just 3 hours! We started by discussing roles that you can take in an ensemble – assertive and passive, or foreground and background, for example. This led to our first whole-group improvisations, which were characterised by fairly homogenous playing, traditional sounds and tonalities, and very little space, and opened up dialogue about the importance of shape, structure, endings, and having both a macro and a micro view of the work. We then divided the group into duos and trios and asked them to develop together a short improvisation, in which all the players switched roles (ie. started in the foreground, but the move to the background, or vice versa). The performances that the duos and trios came back with highlighted the carefulness with which most of them played. To encourage a freer approach to sound and technique, Tony led a short, intense loud group improvisation, cueing the group as a whole or individuals to play loud and fast – as loud and fast as possible. The group visibly relaxed and became more animated during this task. They took more risks and exerted themselves far more. Each person then spent 7 minutes (we were short on time at this point) getting to grips with this personal assignment. They then teamed up with 3-4 other players (of ‘like’ instrument or assignment, where appropriate), and worked together to incorporate these new ideas and sounds into small group improvisations. We listened to the latest improvisations from the small ‘assignment’ groups, then drew everyone together again for some final whole-group improvisations. We’d heard some wonderfully inventive sounds from each of the sections. The difference between these improvisations and our earlier whole-group efforts was impressive – the young players now demonstrated a much greater sense of adventure, and a more acute awareness of the playing going on around them. They worked together in sections far more than earlier, and (generally) left a bit of space for other instruments. No-one played all the time. I think that for this age group of young musicians, the range of tasks is key. They are motivated and engaged and will listen to explanations and ‘teacher-talk’; however, their independent work is really impressive. They get straight to task, work incredibly cooperatively, and generate some truly original material. It’s one of those situations where I think the challenge for the adults is to remember to get out of the way! The young people love to get input, but they also thrive on the independence and ownership of the task. This was the first Toolkit workshop for the KEY program. We have another coming up in two weeks time, and more planned for next year. Each one is led by an Art Orchestra musician on a topic of their own choosing and in their particular area of expertise. As the workshops roll out, I will be logging what approaches and workshop structures are most effective with this age group. Today, the small group work opportunities gave the workshop a particular buoyancy and momentum. In any workshop it is imperative, I think, that the participants have some kind of penny-dropping, “a-ha!” experience, in order to have something tangible to take away. In a short time-frame with an unfamiliar group, this can be particularly challenging to ensure, but I like the energy of jumping in with a new group, and creating something on the spot together. My current project at St John’s Primary Clifton Hill (as their visiting ‘Composer in the Classroom’ for Musica Viva) has asked me to develop a number of short, intensive and engaging composition workshops for early years students, pushing them in some way, but ensuring the experience is complete within the hour. Get everyone to clap on 1. Ask someone to nominate another number and another sound – at St John’s this week, a student nominated beat 5, and a finger-click. Add a few more beats and sounds to the cycle. In a fast-paced workshop it could start to get pretty confusing for the children, but stay with it – this is the preparatory ground for melodic work. Around this point I tend to write the 8 numbers up on the whiteboard and put squares around the numbers that we are sounding. Decide what tonality you want (or not – you may like to leave it to chance), and ask someone to play the tonic note (or any note) on one of the numbers. At St John’s, I specified the note C on number 1 as I wanted as to have a strong anchoring point, and tonal centre. I then invite students (one at a time) to propose pitches for the other numbers in the cycle that we have chosen to sound. By now, we’ll have a melody. You can play it on tuned percussion or other instruments as a hocket, or gradually teach the group all the notes in order. I like to leave it up to them to add the other pitches to their starting note when they are ready. Eg. their starting note might be E on beat 4, so they should get that locked in first, but once they feel confident, they might also decide to play the C on beat 1. At St John’s, a very perky riff in C major emerged. The music teacher and I accompanied it on guitars with a chord progression that moved from C to G, Am, F, and G. We finished the hour-long workshop with a structure – giving each section of instruments (glockenspiels, xylophones, boomwhackers, etc) four repeats of the riff (the number was dictated by the length of the chord progression), before a final section of everyone playing together. It was hard work for all the students. Some didn’t manage to sort out the whole of the riff in the time we had available. However, they all had an understanding of how we had come to this point in the course of the hour and felt incredibly pleased with themselves and their work. I don’t think they’d played any phrases this long on the tuned percussion before. Also, the guitar accompaniment gave their riff a stronger context and sense of tension and release in the music. The plan now is that the riff will form melodic material for a ‘school song’ that we will write with one of the older classes next week. The workshop was complete within itself, but the material that it generated will go on to have a longer life elsewhere in the school. 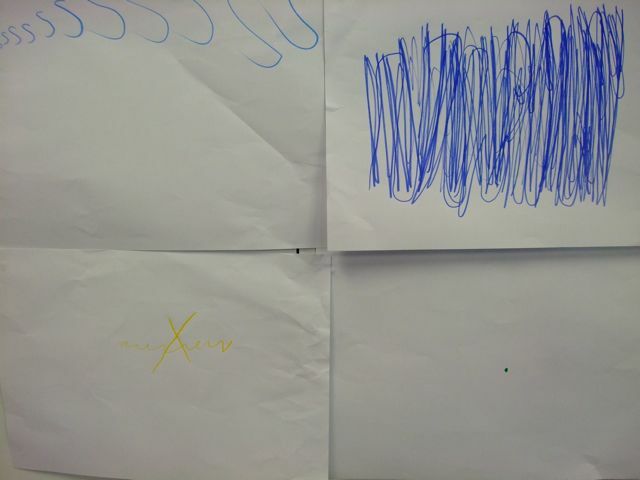 With the preps and grade 1s in my current ‘Composer in the Classroom’ project (for Musica Viva at St John’s Primary School, Clifton Hill), we created a composition of ‘wet’ and ‘dry’ sounds. I suggested that for me, a ‘wet’ sound was one that rang on for a long time after being struck (similar to the way a pebble dropped in a pond creates ripples that last a long time). A dry sound was shorter and more… well, dry. The children selected percussion instruments, listened to each one by one and decided whether the sound was wet or dry. “Wet!” chorused in response to the magical tones of a wind chime. “Dry!” they all agreed after hearing the rasp of a guiro. I explained that the label was a subjective one – they could have their own opinion about what was ‘wet’ or ‘dry’. Some instruments provoked interesting debate – the resonant tones of the djembe for example. They could hear that it had resonance, but not for as long as some of the metal instruments. And as a metal instrument, the cabasa was proof that ‘wet’ and ‘dry’ categories didn’t necessarily align with what the instrument was made of. Next we played the instruments one by one around the circle, but this time, they needed to wait until the ring of the previous instrument had completely ended. This demanded careful listening and concentration – always a risky endeavour with this age group, but they were thoroughly engaged and intrigued by the range of sounds in their midst and were pedantic about waiting until the previous sound had entirely finished (and if they weren’t, one of their classmates would be sure to point it out). 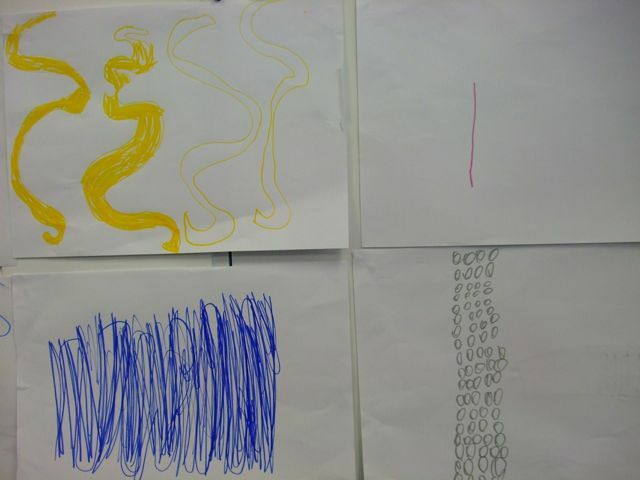 We then moved onto graphic scores. I asked each child to draw a symbol to represent their sound. Some found this a challenging task, but others were impressively painstaking in their approach and their teacher and I marveled at all that they could hear in their instrument’s sound. One girl’s symbol for her glockenspiel note appeared like a huge blue jagged scribble; however, her teacher told me it was actually a very layered image. She’d started with a simple wave form, then added additional layers to it, representing all the complexity of her sound. A girl playing a pair of claves carefully placed a small green dot in the centre of her page (see the second image, bottom right). We stuck the symbols on the wall in a line. The children sat on the floor facing the wall, their instruments in hand, and on my cue, performed their piece. They read their way across their score, each person playing when their symbol appeared, and engaged and focused from beginning to end. I finished marking the last of my Boston University students’ essays earlier than expected so last weekend saw me having pockets of time of something that felt like a Normal Life! I went to see the film George Harrison: Living in the Material World and I’m so glad I did. It was fascinating, inspiring, thought-provoking – I’ve had it replaying in my head ever since. The trailer gives you a taste. It’s one of those films that I want to be able to watch all over again, but for the first time. Also over the last few days I’ve been working on ideas for the AccessFest workshops (AccessFest is a series of music projects for people with disabilities in Armidale NSW that I’m directing) – we are going to explore a theme of Strength, and Being Strong. I’ve been coming up with simple musical ideas and strategies to help us develop some new music for performance. I’m also compiling a list of music material that we can adapt. One idea – in fact the whole idea of Strength – came from a short performance that some of my Melbourne Uni students created, inspired by the Maya Angelou poem Life doesn’t frighten me at all. They sang that title/refrain to the tune of Funge Alafia, a children’s song from West Africa that I’d taught them earlier in the semester. It’s a catchy melody and the words fit perfectly, so I’m planning on using that up in Armidale.